The vocabulary of artmaking can be deceiving. We can analyze how line or texture, for example, can contribute to the overall impact of various paintings, sculptures, and prints, but these single formal elements can also be a subject worthy of independent inquiry. As the artists included in Coloring reveal, conditions of “color” can ultimately offer a range of both physical and conceptual links—to the human body, nature, popular culture, and language. Bill Adams produces works that collapse formal notions of painting and sculpture, and his palette of bold or delicate pinks, yellows, and blues might remind viewers of Frank Stella’s famous 1964 comment, “I tried to keep the paint as good as it was in the can.” Adams is aware of the conceptual references color can bring—be it a blood red lozenge-shape or a totemic cat rendered blue via Bic pen. His constructions often rest on wooden legs and lean against the wall, asking us to consider them as painterly props acting as signs and surrogate figures. Adams’ 2012 exhibition Finalist at K.S. Art, New York, was reviewed in Time Out New York and The New York Observer. Paul Stephen Benjamin’s video installations present a continuous sequence of broken words in various fonts and hand-drawn styles, along with images selected from historical and contemporary media sources. References to “blackness” abound, from the color of the discarded monitors that Benjamin stacks to make his sculptural towers, to the faces of notable African Americans including Shirley Chisholm, Condoleezza Rice, Eldridge Cleaver, Beyoncé, and LeBron James, for example. The sputtering and hypnotic rhythms of his work seem to suggest that a cohesive message about identity is all but impossible, but worthy of continued effort. Rutherford Chang meditates on the color white through an ambitious process of collecting copies of The Beatles two-disc set released in 1968 and commonly referred to as “The White Album.” Each album in the amassed collection of vinyl LPs is arguably the same, except that each bears the signs of distinct use, discoloration, and attempts at caretaking by their owners. At present, Chang has accumulated over 900 copies, and the entirety will be installed both on the wall and in bins for viewers to examine. In addition, a digital recording of 100 copies of the songs overlaid on top of each other—registering various scratches, dust, and differences in the pressing of the records—will be presented. Chang’s project was presented at Recess Activities in New York this past spring and featured in the New York Times ArtsBeat. 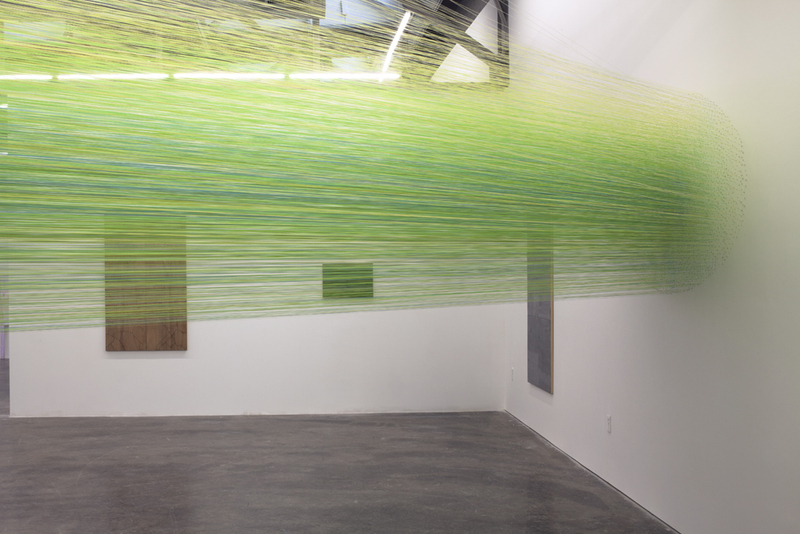 Using the architecture of the gallery, Anne Lindberg will produce a site-specific installation resulting in a cloud of color produced by lines of Egyptian cotton thread tautly drawn between neighboring walls and held in place by numerous staples. 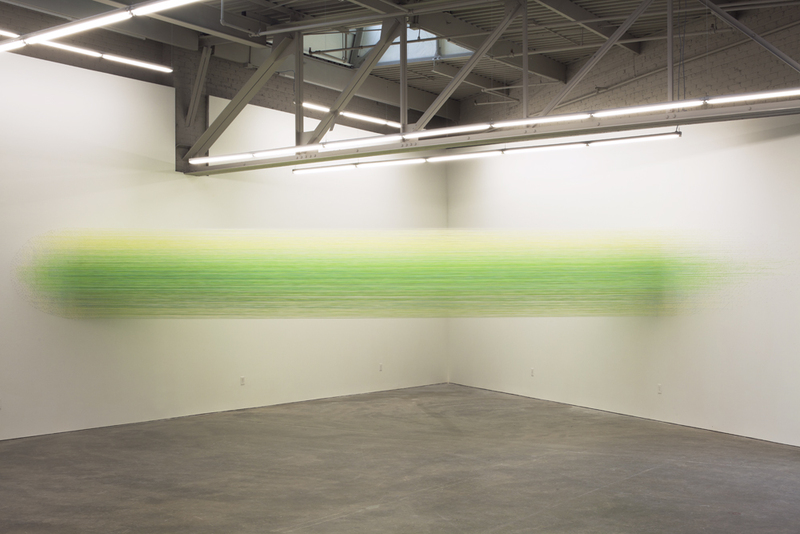 Lindberg's atmospheric work delivers lessons in saturation and dispersal, and one might consider her inquiry as an extension of the color experiments of predecessors including Joseph Albers, Robert Irwin, and James Turrell, as well as acts of ephemeral architecture. Lindberg exhibited in the Placemakers exhibition at the Bemis Center for Contemporary Art in Lincoln, Nebraska and is a 2011 Joan Mitchell Foundation Grantee. In addition, her recently completed GSA Art in Architecture project, curtain wall at the Richard Bolling Federal Building in Kansas City, was awarded a 2013 AIA Kansas City Allied Arts and Craftsmanship Merit Award at an awards reception on November 15. Kate Shepherd is known for spare diagramatic paintings, featuring delicate lines rendered on glossy enamel panels whose finish reflects the environment and the viewer. These qualities ask how one can appreciate and recognize various visual sensations from the natural and industrial world. Shepherd's recent works in laser-cut plywood are based upon the cracked sidewalks in New York's Central Park, and their surfaces are subtly cantilevered, rendering them fragile and charged with emotion. The three works on view articulate the colors of light, wood, and foliage. Shepherd’s 2011 exhibition And Debris at Galerie Lelong was reviewed in ARTnews, The New York Observer, and artcritical. For some, the exhibition title Coloring might bring to mind the childhood process of filling in the predetermined areas of an activities book. Instead, we recognize the serious play of these five artists, whose endeavors offer more complex implications and consequences.